I sent my mom to the grocery store for bean sprouts to add to kimchi jigae but she accidentally picked up mung bean sprouts. 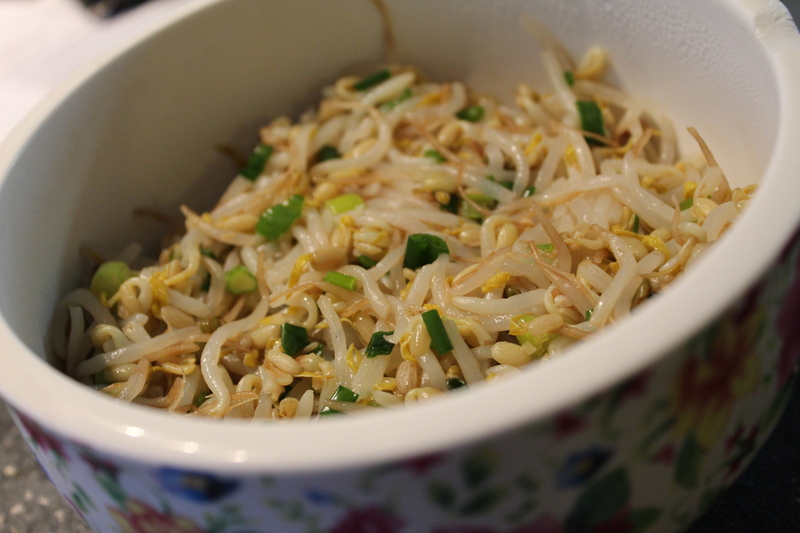 (Our Superstore and Sobeys regularly carry mung beans, but only have bean sprouts on a fluke once in a while). To be honest I thought they were the same enough to just use them instead but my hubby insisted it wasn’t an appropriate substitution. Anyway, I decided I might as well make them into a side dish. Since moving here two years ago, the one thing my husband complains about the most, is the lack of side dishes (particularly the lack of my side dish making abilities haha). 1. Rinse sprouts to get any dirt or bad pieces out. 2. Boil for about five minutes. 3. Drain water and allow to cool for a few minutes. 4. Sprinkle the sprouts with salt and set aside for ten minutes. 5. Squeeze all access liquid you can from the sprouts. 6. Add remaining ingredients and mix up well. There! You’re done! Another side dish in the fridge. Phewf, that was easy wasn’t it? This is one of my favorite Korean side dishes. Yum! Yummy and so very easy!